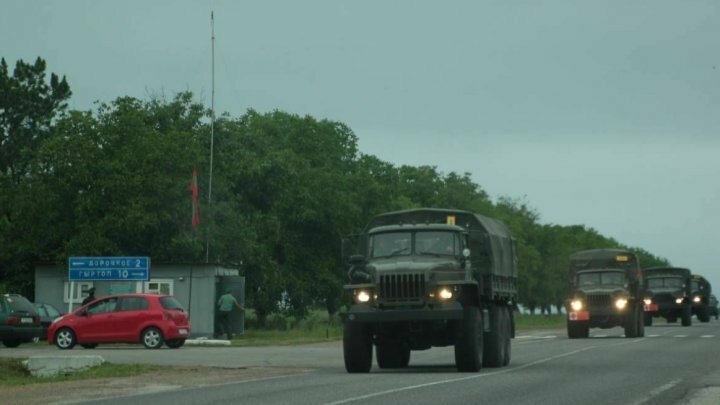 Today, on June 23, around 04:00 and then at 06:30, 11:15 and 13:15, on the Dubasari-Grigoriopol-Tiraspol route, there were 4 columns of Armored and Military Vehicles of the Operative Group of the Russian troops traveling moving unannounced. From the military technique, about 11 TABs and 25 trucks (URAL, ZIL, UAZ) were numbered. There were no distinctive signs of belonging to the GOTR or the peacekeeping operation on the unit, most of the military equipment had their hidden registration numbers. Deputy Prime Minister for Reintegration, Cristina Lesnic, described this action as troublesome. "We have the information that this column is the one that left on June 14, 2018, and today it is probably coming back from the Cobasna Ammunition Depot today, and at the request of the military observers these columns did not stop. We have expressed concern over the OSCE mission that we do not know what has been transported in these armor, "Cristina Lesnic said. Thus, according to the available information, these units are part of the three columns (about 40 units) that on the morning of June 21 went unauthorized to the ammunition depot at Cobasna, Râbniţa district, accompanied by special automobiles of unconstitutional structures of army. Subsequently, representatives of the Russian Federation motivated this movement of military personnel through the need to increase the security measures of the deposit as a result of indications received from the leadership of the Russian Ministry of Defense in the context of possible acts of terrorism and possible challenges during the World Football Championship. At the start of this morning's incident, the Moldovan delegation to the Joint Control Commission called for the urgent summoning of the military observers of the Unified Control Commission (representatives of the Russian Federation, the Republic of Moldova, Ukraine, Tiraspol) who moved at 5:30 in the districts of Dubasari and Grigoriopol (near the Dubasari bridge, Dorotcaia and Mălăieşti villages) to document the situation. Prime Minister Pavel Filip spoke about this topic at a press conference. "Chisinau has repeatedly expressed concerns about the recent intensification of the joint exercises with the structures of the Tiraspol regime. Even the last moves that took place through the Tiraspol Armored Security Area, we we are worried about this, "Prime Minister Pavel Filip said. At the insistence of the Moldovan side, the representatives of the OSCE Mission to Moldova, who at 6:20 fixed the displacement of 4 URAL means and a military inspection unit, were present at the site, and at 07:15 the same units were observed in the village of Mălăieşti from Grigoriopol district. At the request of the military observers to stop the movement of these units, in order to carry out the regular control, they did not react in any way, writes vesti.md. The Delegation of the Republic of Moldova to the Joint Control Commission calls upon all components of the Commission and the Joint Military Command of the Peacekeeping Operation to act in strict accordance with the understandings agreed in the Transnistrian settlement process and to ensure the respect of the Security Zone regime.